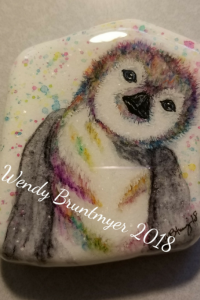 I stumbled upon Wendy Bruntmyer on her art auction site on Facebook. 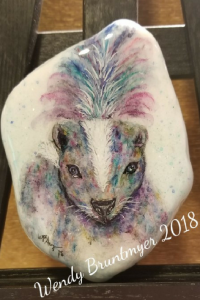 Her hand painted rocks were so adorable, I couldn’t wait to show you them. Wendy Bruntmyer Rock Artist Interview is my first post in our rock artist feature series. Every month, we will be doing at least one artist interview, so make sure you subscribe so you don’t miss a single post. We will also be giving away a monthly artist rock only to newsletter subscribers. Artist interviews will give you fresh ideas on painting rocks and techniques how to improve your skill set. Once you take a look at how adorable these rocks are, you’ll soon want to be painting some for yourself. 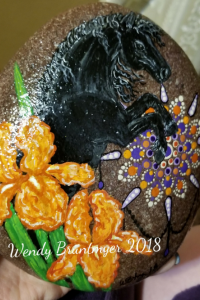 I have a rock painting group on Facebook called Rock Painting Ideas and Resources with over 22,000 members that you can get daily inspiration for rock painting. If you love Pinterest (and who doesn’t?) you can follow me here. Wendy, please tell us a little bit about yourself and the art you create. I am a mom to four handsome young men and Grandma to a gorgeous little girl. I work full-time in my dream career as a safety and health professional. I have been practicing safety for 14 years. In the art I create, I like to use and intermix various mediums. I use acrylic paint, watercolor pencils, archival ink pens, and paint pens. I intermix them in my work. I rarely only use only one medium to create my pieces. I believe they all compliment each other and provide me with more options and freedom in my work. 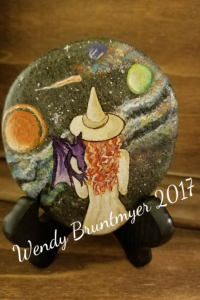 I love painting on rocks as they are smaller, take up less space and come in so many interesting sizes, shapes and colors. 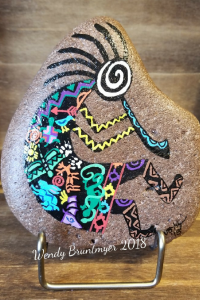 How did you get started rock painting and how long have you been doing it? Finding my first rock a year ago with my beautiful daughter-in-law and granddaughter started me on my journey. I wanted to make someone feel the joy I felt when I found that rock. So I bought paint and brushes, grabbed a few rocks from my yard and I was on my way. I have now been painting rocks for a little over a year. I used to think I hated to paint. Boy was I wrong. My inspiration first started with other artists’ work found in Facebook groups, on Pinterest, and in internet searches. Now it mostly comes from the things I like, such as animals. I’m a avid animal lover and enjoy creating them. I do use photos and artwork from the internet to help me create and get the animals’ anatomy correct. My granddaughter inspires me the most in the magic of life. 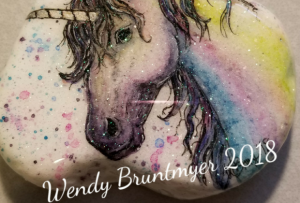 This is where my glitter mixed in resin idea came to me from for my magical unicorns and my fun multi-colored animals. What has been your favorite rock you painted and why? 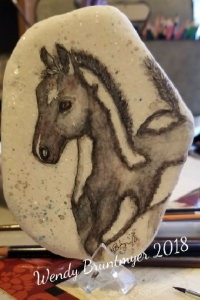 My favorite rock is one I did based on a tattoo my son’s girlfriend showed me. It is a woman’s face that shows her nose and mouth with black ink melting down her face. Where her eyes are supposed to be, a woman is walking through a dark path set in the trees. To me this rock represents the darkness and loneliness we all feel at one point or another in our lives. It reminds me to always remember this and to be kind. A small act of kindness can bring a little light into anyone’s darkness. It can have a little or a huge impact on their life that might turn around a bad day. It might even change their outlook on life. You never know. So, don’t miss out on your chance to make a change, no matter how small. Do you like to jump from project or project or do you like to create clusters of themed stones? I stick to one project at a time for the most part. I don’t have a lot of free time that I can dedicate to creating. So when I get the chance I focus on one project and get it done. When you start a new series of rocks, do you sketch out the designs on paper or do you just start immediately on the stones? I do both. It just depends when the creativity hits me. If I am at home I grab a rock and start penciling in my design so I don’t forget. If I am away from home, I will sketch it on paper and take it home to sketch it again onto a rock at a later time. For the most part I prefer just starting with the stone. Where do you get the beautiful rocks you paint on? I purchase mine. I use a lot of santorini stones for my watercolor work. I order them from landscaping companies in Florida and have them shipped to me. I buy my river rocks from my local landscaping company. Is there a special brand of paint you like to use? Why is it your favorite? What are some of your other favorite supplies? Aqua brushes are my utmost favorite. They allow me to have better control over the water. I do love my Posca paint pens for quick projects. What is a special tool you can’t live without? Why do you like it so much? Do you participate in the kindness rock movement in addition to selling your rocks? I do. I sell my rocks so I can purchase my art supplies and keep helping others to learn and discover new things in my group Watercolor pencil rocks 101. With the kindness movement, I don’t hide much around the local community. I prefer to hide my rocks with the aid of my granddaughter at assisted living centers, hospice and the cancer center. I also love randomly handing them to people I see or setting them close by so they’ll find them. I have been known to stick a rock in the seat of a grocery cart when the person is looking the other way. To me the kindness movement means bringing in a little light into another’s world who needs it while bringing some into my own. It is also about teaching others while reminding yourself the importance of kindness and how much of an impact a kind gesture can have on an individual. What do you wish you knew about rock painting before you got started? What the best supplies were. What works best and what to stay away from. Such as modge podge is not weatherproof and sharpies fade quickly in the sunlight. Thankfully there are now groups and places such as Rock Painting Ideas, where newcomers can get this information and not find out the hard way, as I did through trial and error. What are some of the key elements in creating a rock painting? Preparation. You want to be sure your rocks are clean before creating. Have what you need readily available. Most importantly have fun and relax. What advice would you give to other rock painters? Take photos of your work. Photos help provide a different perspective. I have found this has helped me to make needed changes. Especially when I am working on a three-dimensional effect. What would you say to a beginning rock artist that didn’t feel his or her work was up to par? All art is beautiful. Art comes from the heart and everything that comes from there cannot be anything else but beautiful! Remember you’re your worst critic. Be proud of what you have done always. With each piece you produce you’re one step closer to finding the artist you wish to become. What is the most challenging part of being a rock painter? Can you share with us what a typical day rock painting looks like to you? I will be at my 1950s metal office desk in front of the window. Supplies will be spread over the whole desk with some on the floor. My three shepherds will be lounging in the room. There is always one under the desk and the other two on each side of me. The TV will be on the Hallmark mystery movie channel. Sometimes when I’m lucky my granddaughter is with me and the TV is tuned in to a cartoon show. Where in your home do you paint? What does it look like? I have a spare bedroom that I turned into a studio. It is a 10′ x 10′ room with a window that looks out onto my front yard. My desk sits in front of the window. I have a TV, three shelving units that holds some of my private collection along with supplies and a portable green house. The green house is my dust free atmosphere for curing resin. More of my original multi-colored critters and a new series of fairy tale girls. How can people buy your artwork and find out more about you? Currently I only sell in my auction group, All Art Auctions. I do not take commissions. I just do not have the time. But, I do love to share knowledge and tips with others and would love for people to come join me in Watercolor Pencil Rocks 101. I am currently working on a page separate from my personal Facebook page for people to be able to follow me and see the new art as I create it. The page is called Rocks by Wendy. I am hoping to have it up and running by the time this is posted. I would like to thank Wendy for taking the time to share with us her ideas and techniques. If you want to get started on rock painting – check out the resources below. We’ve reached the end of the Wendy Bruntmyer Rock Painting Interview. Don’t forget to subscribe to our newsletter to be eligible to win our monthly rock giveaway. Make sure you pin the post below so you can refer back to it again and again.